Yellow leaf spots affect many types of plants and have many different causes, including fungal diseases. The spots interfere with photosynthesis and prevent plants from creating the energy needed for growth. 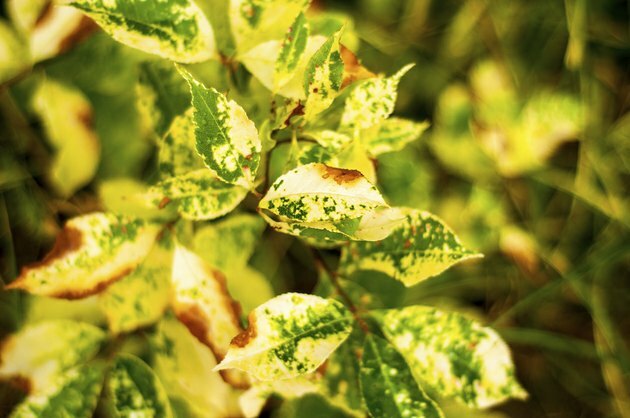 As you enjoy your yard or garden, take time to inspect your plants for yellow spots. Various factors, including the shape and location of yellow spots, can help you diagnose and control the problem. If you use fungicides, wear protective clothing and gloves, and keep the chemicals away from children and pets. Some leaf diseases show as dark spots with yellow halos. Yellow leaf spots have various shapes, depending on the cause. Downy mildew starts with angular pale yellow spots. In cucumbers (Cucumis sativus) and other cucurbits, powdery mildew causes pale yellow spots followed by powdery white patches. Cucumbers grow in U.S. Department of Agriculture (USDA) hardiness zones 2 through 11. Scab causes yellow halos around light gray spots that fall out of the leaf and create a yellow "shot-hole" appearance. In maple trees (Acer spp. ), tar spot disease causes 1/8-inch yellow spots with black, tar-like centers. Maple trees grow in USDA zones 3 through 9, depending on the species. The location of the yellow spots may help you determine the cause of the symptom. Some diseases, such as powdery mildew, cause spots on older leaves first and then spread to younger leaves. Yellow spots from powdery mildew can occur on upper and lower leaf surfaces. Downy mildew spots occur on the upper sides of leaves between leaf veins that give the spots their angular shape. Tar spot symptoms occur in sheltered or shaded maple leaves. Temperature and humidity can promote certain causes of yellow leaf spots. Downy mildew spreads rapidly in moist conditions at temperatures between 59 and 68 degrees Fahrenheit, notes the University of Minnesota Extension. On the other hand, powdery mildew occurs in the summer at temperatures between 68 and 81 degrees Fahrenheit. Besides shade, tar spot disease needs a moist environment. Scab overwinters in plant debris and is most active in humid conditions when temperatures are about 70 degrees Fahrenheit. Additional symptoms can provide clues for diagnosing the cause of yellow spots. Premature leaf drop in a maple tree, for example, is another symptom of advanced tar spot disease, which causes mostly cosmetic damage. The black centers on tar spot-infected maple leaves can enlarge and look like splashes of tar on the leaves. Downy mildew can cause leaf distortion and fine white threads on the undersides of leaves. White powdery mildew mold can cover entire leaves and stems, and can lead to wilting and browning. Once you have made a diagnosis, you can manage the cause of yellow leaf spots. Remove and destroy diseased plants, for example, and remove and rake dead plants and leaves in the fall. Air circulation between plants and drip irrigation instead of overhead sprinklers keep leaves dry and help prevent scab, tar spot and downy mildew. Sulfur is effective against many fungal diseases, including powdery mildew and scab. You can spray a mixture of 1 to 3 tablespoons of sulfur, depending on the plant, in a gallon of water on upper and lower leaf surfaces on infected plants. Apply sulfur before anticipated rainfall, and avoid applying during the hottest weather. A professional landscaper can apply chlorothalonil, which is effective against downy and powdery mildew.